Delta Is Getting Rid of Boarding Zones. Here’s How the New Process Works. For frequent fliers and occasional trip-takers alike, airline boarding is easily among the most frustrating parts of commercial air travel. While most airlines designate different zones for their passengers, and board accordingly, it rarely prevents people from lining up at the gate gumming up the works. In response to years of complaints from travelers, Delta Air Lines announced plans to scrap the standard zone boarding system. But fear not -- they’re not going to allow a free for all ahead of their flights. 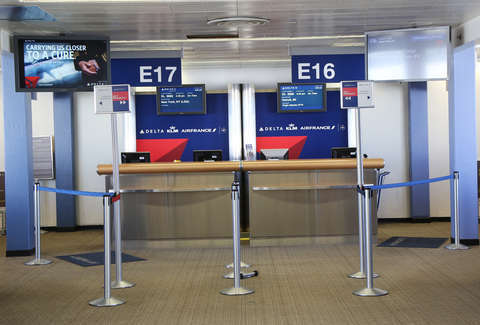 Instead, Delta’s implementing a brand new system, which includes more boarding groups and an easy-to-follow color code they hope will make the airline boarding process smooth sailing (er, flying?) or, at the very least, a little less of a chore. How’s it going to work? Those flying in Delta’s luxury cabin, Delta One, on select international and transcontinental flights will board first -- after pre-boarders, that is -- in their own Delta One boarding group. First class and premium select passengers in the premium select boarding group will go second. In a move that’s sure to ruffle some feathers, Delta has created a separate boarding group for travelers who pay extra or get upgraded to Delta’s Comfort Plus seats at the front of the main cabin. Comfy seats, extra leg room, dedicated overhead bin space and complimentary drinks? Money talks, people. While this change is likely to be viewed as controversial, it’s been tried and tested with great success, according to the carrier. Frequent fliers in the Sky Priority boarding group (Platinum and Gold Medallion Members) will board fourth with main cabin passengers following after. Those flying in the main cabin will see Main Cabin 1, 2, or 3 printed on their boarding pass. Frequent fliers in the airline’s lowest tier and certain credit card holders will be lumped into the Main Cabin 1 group. Last, but certainly not least, to board will be those travelers who purchased Delta’s cheapest airline tickets in the new basic economy boarding group. This group will still be allowed one free carry-on bag, though they may be asked to check it at the gate if overhead bin space fills up. 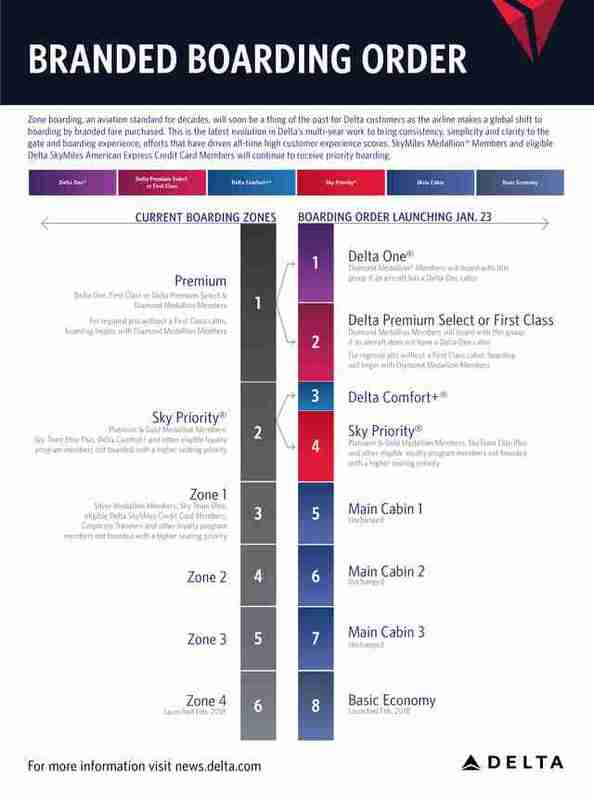 Delta’s brand new boarding system launches January 23, 2019, whether you like it or not.